Personal hygiene is something that the average American takes for granted. But when you’re out on the road for days at a time, it can get a little trickier. It’s important to become familiar with truck stop shower facilities and to use them frequently. Truck drivers should always strive to present a professional image, especially as they are often the only representative of a trucking company that a client might interact with in person. Pack all of your hygiene items and your change of clothes into a water-resistant duffel bag. If you’re using one of the truck stop’s towels, follow their instructions for returning it afterward. Some of them may prefer that you leave the towel in the shower unit, while others want you to drop it in a hamper outside. Depending on the truck stop and the region, it may cost between $7 and $10 to rent the shower facilities. 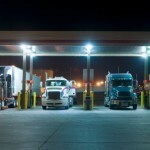 The costs can quickly add up, so take advantage of the shower credits offered by most of the larger truck stops. Each time you purchase a minimum amount of fuel, you’ll be issued a shower credit that you can use for a complimentary shower. If you aren’t going to use it right away, write down the name of the truck stop and expiration date of the credit so you’ll remember to use it later. You can get the inside scoop on life as a professional truck driver when you attend an open house event at Yuma Truck Driving School. While you’re here, be sure to ask us about financial assistance. Aspiring drivers in Arizona can call (888) 647-3239.